Last night I had a semi-authentic Cincinnati cheese coney. I'd never had Cincinnati chili before so I decided to try it in what might be it's most traditional form. Other than the fact that the hot dog, bun, cheese, and onion were all organic I'd say this was as traditional as possible as I could achieve here on the east coast. Tonight, however, I decided to make my own Cincinnati chili. I tried to follow an authentic recipe and cooked up some diced onion with a little Canola oil then added some grass fed ground beef, chili powder, cinnamon, cumin, allspice, clove, tomato sauce, cider vinegar, cayenne, and a bay leaf. I also put in a small amount of my chicken stock from the freezer and simmered the chili in the pot for an hour and a half. This seemed like a lot of time but if that's what they do in Cincinnati then I was determined to bring the same unnecessary cooking time to New York! 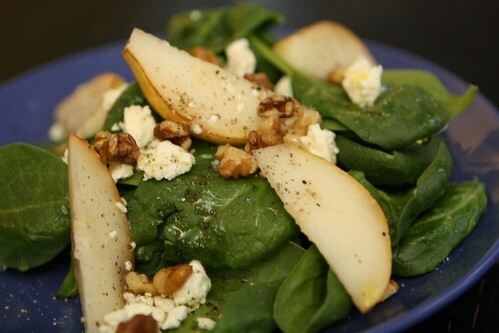 While the sauce simmered I made this salad with spinach, feta, sliced pear, chopped walnuts, lemon juice, olive oil, salt, and pepper. Why this combination of ingredients? Because that's what was lying around. It actually turns out that it was pretty delicious so that was a nice bonus. The question as to whether this salad has anything to do with Cincinnati could be debated. I imagine if there is a common salad (or salad at all) that you would find in close proximity to a cheese coney it would likely feature large amounts of iceberg lettuce and shredded carrot. Sorry, Cincinnati. I'm from Rhode Island. There the iceberg lettuce is also topped with corruption and joblessness. Since I'd had the cheese coney last night, this evening I decided to do the second most popular way of serving. Or maybe it's the first most popular. I haven't actually researched this. This one time I did stop for gas in Ohio so I think I have a pretty good sense of what goes on there. The second most popular way is, of course, the same as the hot dog except replace the hot dog, mustard and bun with a pile of spaghetti. 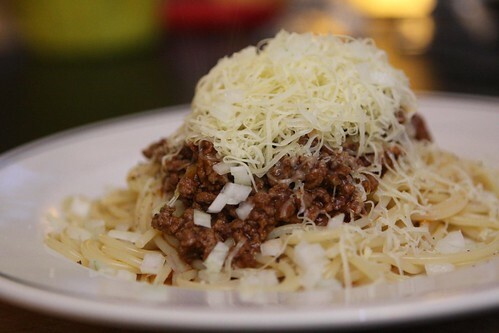 The chili over the top, chopped onion, and shredded cheese remain the same. This time, however, I used an aged cheddar, one without unnecessary annatto. The dish was pretty good. I do like how shredding the cheese on the smallest part of the cheese grater allows it to melt evenly over hot chili creating a sort of cheese sauce. This pasta reminded me, slightly, of the pasta with meat sauce I always used to order at Vallee's, an Italian restaurant that we frequented in my childhood. Only it had less tomato, more spices, and less electric statues of Venus de Milo which lit up and pumped water down tiny Ionic columns. I may have already stated that it is very difficult to find any beer from Ohio in the state of New York. 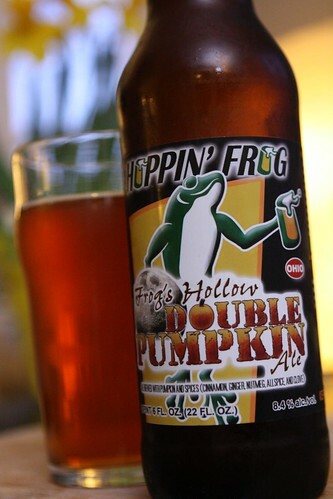 Tonight, however, I was able to find this Frog's Hollow Double Pumpkin ale from Hoppin' Frog Brewery in Akron, Ohio. This wasn't exactly an appropriately seasonal beer. It was probably released exactly six months ago. It was important that it at least came from the same state as Cincinnati, albeit Akron is just about as far away from Cincinnati as you can get while still staying in Ohio. This beer was much different than I expected. It did not really have any bitterness at all. It actually tasted more of banana than pumpkin and the spices blended well with the spices in the chili. Probably because they're pretty much the same spices. On the back of the label it says that it clocks in at 7.3 IBUs. If you have to put a decimal in when you're measuring IBUs that's a pretty good sign that it's not going to be bitter at all. 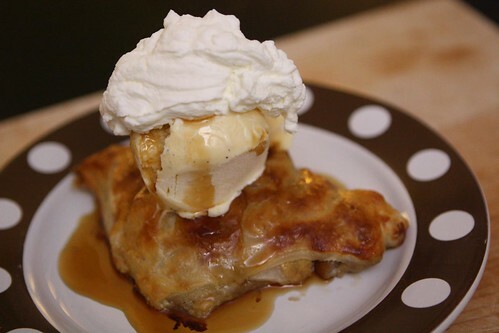 For dessert I crafted another un-Ohian dish. It may not have been in the spirit of the great state of Ohio, but it was in the spirit of saving a bunch of money and using up some crap that was in the freezer. I used a lot of the same ingredients from the salad. I had some pears that were just about ready to die in my vegetable bowl (where 'bowl' means an old Clementine box) so I chopped them up, tossed them with a little brown sugar, raisins, candied ginger, and chopped walnuts. Then I rolled them in some puff pastry dough before baking them in the oven. I topped them with some ice cream, whipped cream, and reheated barleywine caramel sauce. The result was quite tasty and the beer actually worked very well with this course as well. Everyone on Facebook today was talking about Wrestlemania, which I find odd because I don't remember anyone ever mentioning Wrestlemania (or Wrestling for that matter) on Facebook before. 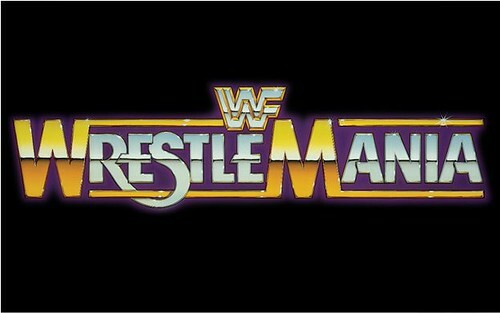 I have missed the last couple of Wrestlemanias. The last twenty-five to be precise. 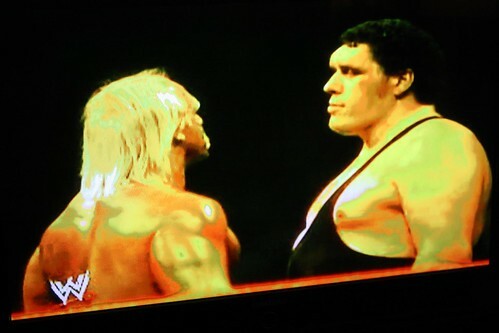 So I decided to watch the last one I saw: Wrestlemania III! It's been a long, long time since I sat down and listened to Jesse "The Body" Ventura commentating on a wrestling match. It was a golden age of fake sports that is hard to duplicate. The bright primary colors of the 80's gave way to the tribal tattoos and general baddassery of the 90's 00's and 10's until we have whatever sort of thing is going on in wrestling nowadays. I can't really say as I've had my eye off the ball for roughly the past quarter century or so. Jen returns late tonight and I look forward to seeing her again despite the wild adventures I've had in her absence. You know, the kind of adventures that involve sitting around on a couch eating chili. You know why? Because I'm a real American.